The quintessential Tuscan wedding: simplicity, beauty, history and art, for a couple with extremely refined and never gaudy taste. Carla is Italian but for the last few years she has been working for an international company in Switzerland which is where she met Dirk, a German architect. 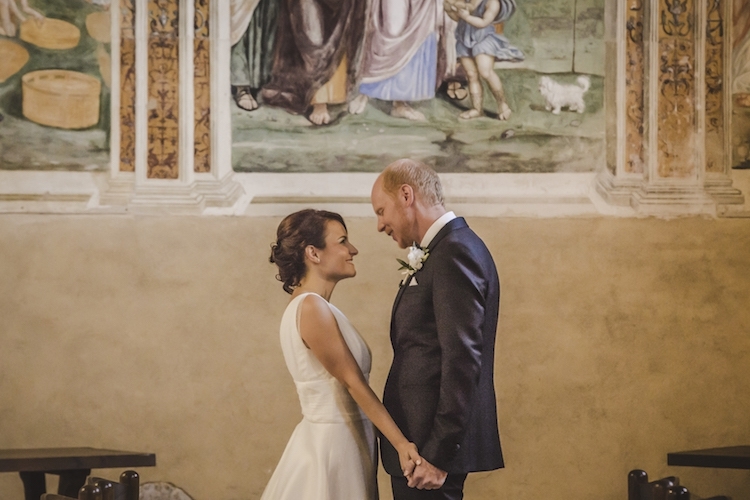 They wanted to be surrounded by their closest friends and family on their wedding day and chose the Val d’Orcia, which they had discovered a few years earlier on a holiday. Sant’Anna in Camprena is a splendid monastery near Pienza, built in the 14th century and famous all over the world as the location for the film “The English Patient” directed by Anthony Minghella, which won nine Oscars. Here, the classic icons of Tuscany shine in all their splendour: the olive trees, the thick red-brick walls that hold a secret courtyard, the mysterious church, and especially the priceless frescos painted by Sodoma in the 16th century in what was once the monks’ dining hall. Carla’s simple and elegant gown was designed by the famous Italian brand Peter Langner and was matched with a pair of Jimmy Choo sandals and bouquet of white roses and olive branches by Flowers Living. Dirk also chose high Italian couture with his dark Corneliani suit and handmade Principe di Milano shoes. As accompaniment for the ceremony in the Sant’Anna in Camprena church, a special guest musician: Elena, sister of the bride and violinist for the National Academy of Saint Cecilia Orchestra in Rome. To counterpoint the great spirituality of the location, simple and elegant decorations were chosen featuring olive branches and white flowers. Big terracotta vases were placed at the entrance of the church while romantic lanterns lined the nave. At dinner, the same white and green palette trimmed the long tables with linen tablecloths, Ginori golden line dishes, chiseled wine chalices, and classic Tuscan chairs. The same leitmotif was seen on the graphic designed by Studio Alispi used for the invitations, menu, seating cards, and the lovely tableau. 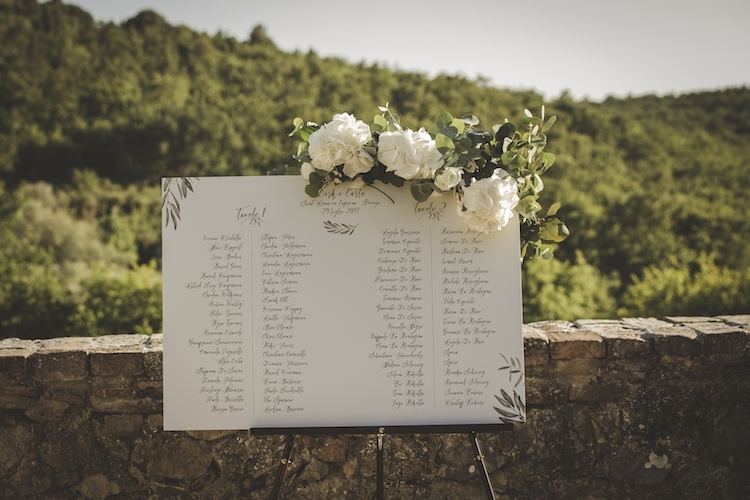 Drinks were held in the Italian garden with a view of the unmistakable Val d’Orcia countryside to the lively folk tunes of the Orchestra Matterella which got all the guests, including the newlyweds, on their feet. The Tuscan dinner, served by Galateo Ricevimenti in the garden illuminated by string lights, ended on a sweet note with the pastry chef preparing a splendid millefeuille right in front of the guests for dessert. The celebrations then moved to the lemon-house where an open bar and DJ kept the guests dancing until the early hours of the morning.